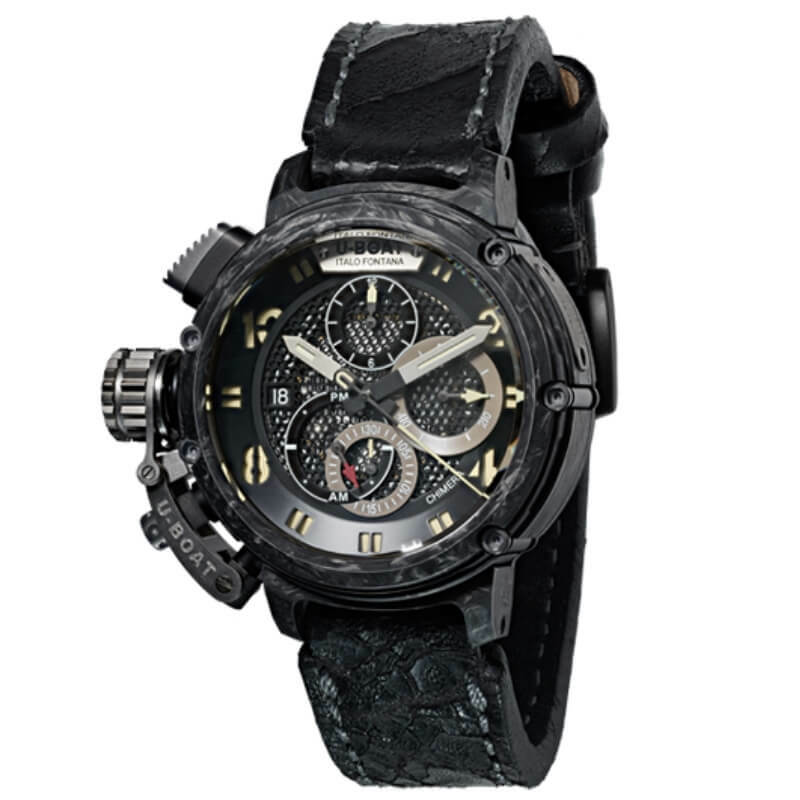 Automatic chronograph modified and personalized at U-BOAT specification. Personalized rotor, in silver, built with a base and 3 bridges fixed with blued screws. Frequency 28,800 vibration per hour, 4 Hz Power reserve: 48 hours, 25 jewels. Case body, back case, bezel ring in forged carbon, characterized by high strength and lightness. Components in titanium. Diameter 46 mm. Distinguishing crown on left side, with a patented protective device. Skeleton dial with four superimposed levels, with the last layer made of laser cut fine stainless steel wire mesh, partially revealing the movement. Superluminova beige index. Laser cut hour and minute hands. Hands treated with superluminova. Hand of the 24h indicator in red colour. Sapphire curved with anti reflective treatment on the face and flat on the back of the timepiece. Hand made and hand finished calf leather, carefully selected and processed following the traditional handcrafted techniques, which give the strap a naturally distressed feel and look. Tongue buckle in titanium. Width: 20/22mm.